When something doesn’t go as planned or causes pain, people like to have an easy target to blame. Knowing what to blame can be a way of shifting or assigning responsibility. In some cases, this is an excuse to avoid responsibility—but for health issues like heel pain, knowing what to blame can help you get more accurate foot care. Painful heels come in many varieties, with many potential causes. Plantar fasciitis – One of the most common culprits, this condition involves a ligament that attaches to the sole of your foot. Pressure and overuse can stretch and damage it, causing pain in the back of your foot. 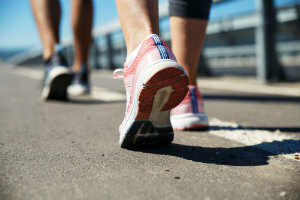 Achilles tendon problems – This tendon connects to the back of your heel. When it gets aggravated by overuse or other injuries, it can make the back of your foot hurt. Bursitis – Pressure and friction on the back of your foot can create inflammation in the fluid-filled sac there that’s designed to protect your heel from damage. Stress fractures – Repetitive impacts over time can actually lead to small cracks in the bone tissue. Tarsal tunnel syndrome – Pinching the nerve on the inside of your ankle can lead to nerve pain throughout the back of your foot. Haglund’s deformity – Pressure on the back of your foot can enlarge a bony growth there and contribute to other heel problems, like bursitis and Achilles pain. Other potential culprits, like bone tumors, are much less common. Ultimately, the best way to determine what is causing your unique foot pain is to have your lower limbs examined by a specialist, like one of our podiatrists at Absolute Foot Care Specialists. Don’t just live with heel pain when you don’t have to. Identify your heel pain cause so you can get foot care and live pain free! Contact our Las Vegas offices online or by calling (702) 839-2010 today.